Barnard’s Inn was recorded as part of the estate of Sir Adam de Basyng, Mayor of London, in 1252. In 1454 the property was established as an Inn of Chancery. The Inn was a school for law students, who then passed on to the Inns of Court. Barnard’s Inn, together with Staple Inn, became associated with Gray’s Inn. In 1892 the freehold was purchased by the Mercers’ Company and the building housed the Mercers’ School from 1894 until 1959. The Hall dates from the late 14th century, with early 16th century linen-fold panelling. The historic chalk and tile walling preserved in the southern wall of the Council Chamber below the Hall is much older, dating from the Roman period. The hall suffered substantial damage during the Gordon Riots of 1780. Next door, on the site of Buchanan House, there stood a distillery owned by a Roman Catholic, Mr Langdale. His premises were burned down by the rioters, and he only escaped by scrambling through a small hole in the cellars into Barnard’s Inn. The Hall was damaged and several of the residential chambers destroyed. The cellars were flooded, and one of the officers of the Inn, on the second day after the fire, “saw a sturdy fellow at the pump, pumping up not the pure water now flowing in this excellent spring, but gin scarcely impregnated with the water, which he doled out for 1d. a mug to the crowd of miscreants thirsting from the heat of their exploits…” The Inn received sums totalling £3,200 from the authorities towards the cost of restoration. In 1931 the Hall was systematically restored by the Mercers’ Company. The old roof timbers were scraped, made good and put back in their places, and a dignified stone fireplace of Tudor design was put at each end of the Hall. The panelling was carefully cleaned and restored, with missing pieces replaced. The windows were re-glazed, re-leaded and provided with new oak frames, and the flooring restored. The Hall is of three timber bays. It retains its timber louvred ‘fumer’ or smoke vent. The two transverse frames are apparently pairs of base crucks with tie beams supporting a crown post and collar purlin roof. These crown posts are important, being the only surviving examples in Greater London. In 1990 the building, including the Hall, was again refurbished with facilities needed for meetings, dinners and functions. 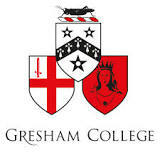 Barnard’s Inn Hall has been the home of Gresham College since 1991. 80 delegates theatre style 60 guests for lunch or dinner 80 guests for a reception Toilets, including a disabled toilet, available. Adjacent to the Hall is the Ante Room and a small fitted food preparation room with refrigerator, freezer and dishwasher. The Ante Room measures 31 square metres (328 square feet) and is suitable for small receptions for up 30 guests or for meetings for up to 15 people. 60 delegates theatre style 50 guests for lunch or dinner 80 guests for a reception Toilets are available on the same level. Access to the lower ground floor is not suitable for disabled guests. We are happy to provide details of a range of companies who can provide all your catering requirements, from small receptions to large banquets. For all enquiries about hiring Barnard's Inn Hall please contact hall-booking@gresham.ac.uk.